Ingredients: Chicken, chicken meal, pea, tapioca, ocean fish meal, chicken fat (preserved with mixed tocopherols), tomato pomace, quinoa, flaxseed, natural flavor, turmeric, dried egg, chia seeds, potassium chloride, salt, choline chloride, dl-methionine, salmon oil (preserved with mixed tocopherols), dried chicory root, carrot, pumpkin, parsley, apple, cranberry, blueberry, lettuce, celery, beet, watercress, spinach, broccoli, spearmint, almond oil (preserved with mixed tocopherols), sesame oil (preserved with mixed tocopherols), yucca schidigera extract, dried kelp, thyme, lentil, vitamin A supplement, vitamin D3 supplement, vitamin E supplement, zinc sulfate, niacin, ferrous sulfate, l-ascorbyl-2-polyphosphate, calcium pantothenate, thiamine mononitrate, copper sulfate, riboflavin, pyridoxine hydrochloride, manganese sulfate, zinc proteinate, folic acid, calcium iodate, manganese proteinate, copper proteinate, sodium selenite, biotin, vitamin B12 supplement, rosemary extract, dried lactobacillus acidophilus fermentation product, dried enterococcus faecium fermentation product, dried lactobacillus casei fermentation product. 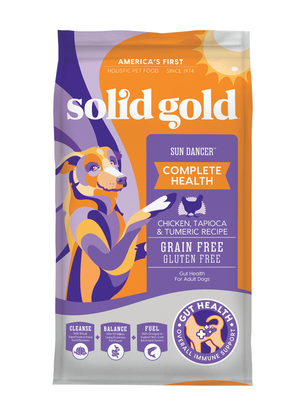 Solid Gold Sun Dancer Chicken & Tapioca Recipe With Quinoa is formulated to meet the nutritional levels established by the AAFCO Dog Food Nutrient Profiles for all life stages. We'll begin this review of Solid Gold Sun Dancer Chicken & Tapioca Recipe With Quinoa with a detailed discussion of the ingredients. The fourth ingredient is tapioca. Tapioca is a gluten-free starch extracted from cassava roots. Starch is a necessary component in producing kibble and tapioca is an excellent choice in this regard. The fifth ingredient is ocean fish meal. Ocean fish meal is produced by cooking ocean fish using a process called rendering. The rendering process dramatically reduces the natural moisture of the ocean fish and thereby results in a highly condensed protein source. Because ingredients are listed in order of pre-cooked weight, the remaining ingredients in Solid Gold Sun Dancer Chicken & Tapioca Recipe With Quinoa are not as important as the first five ingredients. Next we have chicken fat (preserved with mixed tocopherols), which provides a healthy dose of omega-6 fatty acids. The next ingredient is tomato pomace. Tomato pomace is a by-product of tomato manufacturing. It's considered a controversial ingredient because many people believe it is an inexpensive low quality filler. However, tomato pomace provides a notable amount of dietary fiber, B vitamins, Lycopene, and vitamin A. Although it is a very inexpensive ingredient, it is not nutritionally empty. Then we have quinoa. Quinoa is considered a "pseudocerial" because it's typically used like cereal grains (i.e. corn, wheat, millet), but it's not part of the grass family. Quinoa is high in protein and provides a much better essential amino acid profile than most true cereal grains. Furthermore, quinoa is naturally rich in many vitamins and minerals. Moving on, we have flaxseed. Flaxseeds are an outstanding source of omega-3 fatty acids and dietary fiber. They also provide a notable amount of protein, B vitamins, and various minerals. Moving on with this review, we have natural flavor. Although natural flavor does not provide any nutritional value, it does improve palatability. The remaining ingredients in this Solid Gold Sun Dancer recipe are unlikely to affect the overall rating of the product. The official PawDiet rating for Solid Gold Sun Dancer Chicken & Tapioca Recipe With Quinoa is 5.0 out of 5.